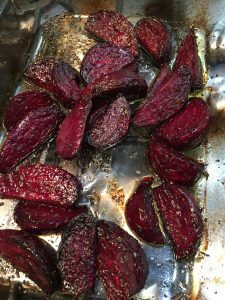 I used to think beets were bland, they are usually prepared without any seasonings, roasted in foil until soft and then added to salads or other dishes. 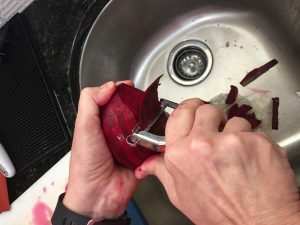 After researching several recipes I proceeded with peeling, quartering and roasting beets with salt, pepper and dried thyme. 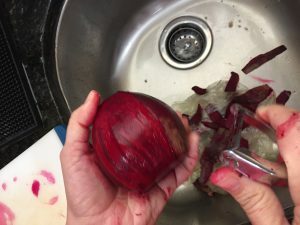 I found this method of preparing beets to be the most delicious – and so did my family! 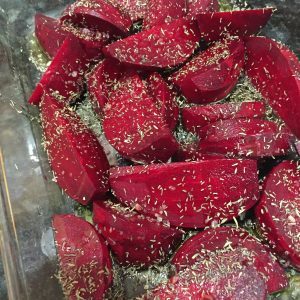 I usually make Roasted Beets on a Sunday and keep the extras to add to salad’s during the week. We enjoy them over a bed of mixed greens and / or spinach topped with either goat cheese crumbles and / or sliced avocado. 4. Enjoy on a Salad or as a side dish with your favorite dish.